In the well-known fairy tale, the little girl Goldilocks avoids the porridge bowls that are too hot and too cold, instead choosing the one that is “just right”. 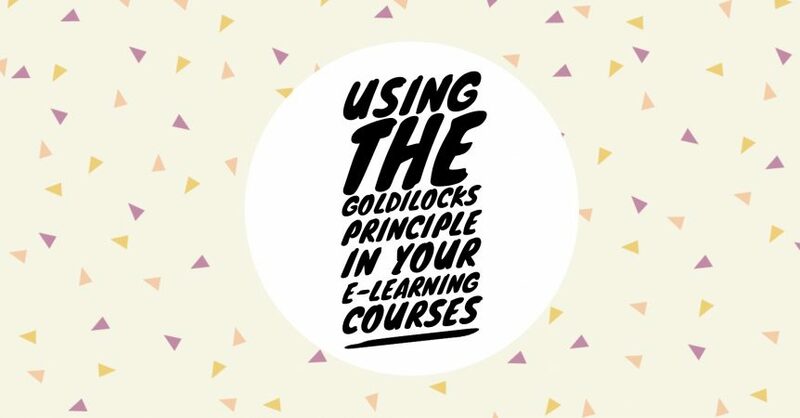 You probably never thought this simple children’s story would have any relevance to e-learning, but the Goldilocks principle can help make your courses more engaging. You can apply the Goldilocks principle in a range of scenarios, in fact, from engineering to psychology to learning. The principle is that when presented with choices that are similar, people usually go for the most moderate option. An e-learning course that is too hot or too cold will put off e-learners. This can impact retention rates, engagement rates, and, ultimately, return on investment. Ideally, you should create e-learning courses that are “just right”. Too hot – when the content of the course is too complicated, there is too much information, and/or the presentation of the content is complex. This has a negative impact on learners because they must work too hard to understand the content, get through all the content, or figure out the structure or framework of the content. Too cold – when there is not enough content or when the content doesn’t go into the detail of the topic enough. Learners in this situation feel they haven’t learned anything and have wasted their time. Just right – the right amount of content at the right level of complexity. So, how do make your e-learning courses “just right”. Here are eight tips to help. The first step is to fully understand the capabilities, levels of knowledge, and motivation of the learners you want to complete the course. This will help you judge where to set the course in terms of complexity, as well as how much information to include. You may also need to customise the content, particularly if the audience you identify has varying levels of knowledge and skills. There may also be variations in terms of motivation. Building flexible modules that enable you to deliver a customised learning experience for each distinct group of people will help you overcome this problem. This one is particularly targeted at preventing the course from being “too hot”. Microlearning is a learning technique that delivers course content in bite-size chunks. This breaks down the content in a way that is easier for the learner to get through and understand, making it an ideal strategy to use when the topic of the e-learning course is complex. There are situations when the complexity of the course is appropriate, but the course is still considered “too hot”. This is often because the course is poorly designed. Using a clutter-free design that is as distraction-free as possible. In fact, the visual design of the course should facilitate the learning experience rather than get in the way of it. You need to make the navigation intuitive. Ideally, learners should be able to progress through the course without even thinking about it because the navigation is natural and obvious. Include tooltips, avatars, and other tools to support learners and help them progress through the course. Making the course relevant to the day-to-day experience of the learner will also help you get the pitch “just right”. For example, making the content relevant can help the learner grasp the idea or skill you want them to learn as they are able to see how it fits into what they do, rather than having to think of it in an abstract way. Additional resources can help those struggling to understand the content of the course and it can help those who understand it well. For the first group of people, additional resources can expand on complex topics and can also give learners something they can refer back to in the future. This takes away the immediate pressure of memory and retention. For learners who understand the content of the course well, additional resources can let them explore the topic further to increase their levels of skill and knowledge. It is also important to ensure there is adequate support from a real-life person. This is especially important when the topic of the e-learning course is complex. This can be applied to other aspects of the course too, particularly interactive elements. You should think of scenarios and other elements as learning tools rather than tests or assessments. So, instead of saying XYZ answer is wrong, explain the consequences of the answer before going on to explain a preferred or more beneficial approach. As you can see, all the above tips involve focusing on learners as much as possible – understanding their abilities and tailoring the course in ways that help them get through it successfully. When you do this, you will have an e-learning course that is “just right”.